PRICE DROP! LED String Lights and Remote just $4.49 SHIPPED with Code! Use coupon code R7ERYFSH to drop the price to $4.49! 【Safe and Convenient】: 12 months warranty + 6 month extended after registration and 24/7 customer support. UL588 and TUVus Approved for Safer usage. 【Eco-friendly and energy efficient Christmas Light 】: The LED String Starry Light will not overheat after many hours of usage. You can safely touch it even after 14 hours of usage. Warm white-yellow Mini Led Lights are so bright and they illuminate a dark corner and create a romantic sentiment. 【Waterproof Battery Power 】: The low profile that is easy to hide away and disappear from the scene. Its safety is guaranteed with UL certification, powered by 3 AA Batteries(NOT INCLUDE). Copper wires are also waterproof, so there is no any problem to use it in the rain. 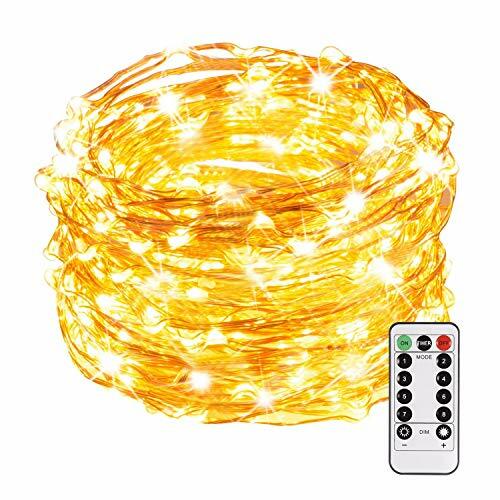 【Dimmable Led String Lights】: 100LEDs Copper String Lights come with a 13 keys remote control for turning on/off the lights, adjust the Brightness, changing the lighting modes(8modes) and setting time (6 hours on, 18 hours off, cycle daily). The Decor lighting is perfect for spice up your decoration and adds welcome feelings to your party, restaurant and shops. 【Creative String Lights】The Copper Wire Lights can be easily bent, and shaped around plants, signs, furniture and almost everything else. Mold the copper lights into any shape you can think of, easy storage and ready for next use. Please kindly note that the string light could not be extended or connected together.